Do you want a solid list of high paying affiliate programs to earn more commission every month? Whether you know it or not, majority of the income that we make from Bloggers Passion comes from promoting affiliate products. Not just us, but look at any other profitable blog that makes a lot of money such as Smart Passive Income, Matthew Woodward’s blog etc, you’ll notice that affiliate marketing is their #1 income source. Do you know why almost all the successful bloggers focus on affiliate marketing? It is the #1 way to earn passive income every month. So if you’re looking for high paying recurring affiliate programs to make money from your blog, don’t miss out this post. Let’s find out some of the best affiliate products you can promote in 2019. How to choose the best high paying affiliate networks to promote? Hands down, SEO affiliate programs are the best when it comes to earning more commissions as an affiliate. You can get high conversions rate by promoting the SEO affiliate programs mentioned below if your target audience are marketers or people who are looking to increase their website’s search traffic. BeRush it is the affiliate program to promote the world’s #1 SEO tool called SEMrush which gives you hefty commissions per every sale you make. The best part is, it gives you recurring commissions so as long as a user pays for SEMrush, you earn commissions. Who is this BeRush affiliate program best suitable for? This is for beginners to advanced level affiliate marketers. Best suited if you’re an SEO enthusiast who’s interested in promoting an incredible SEO tool, BeRush is definitely a great affiliate program to promote. Here’s what you need to know before promoting SEMrush affiliate program. What’s the cookie duration? 10 years of cookie life! How can you get paid? You can get paid twice each month (around 10th & 25th of any month) via PayPal once you reach a minimum threshold limit of $50 in your account balance. You can also get paid via wire transfer if you earn $1000 or more in affiliate commission. How to sign up for BeRush affiliate program to promote it? Click here to join BeRush and start promoting SEMrush SEO tool to earn 40% recurring commissions on every successful rebill. Have you ever heard of KWFinder? It is one of the most popular tools for doing keyword research. Mangools is the one that provides KWFinder along with few other impressive SEO tools. So if you’re looking for such incredible SEO tools to promote to your audience along with lucrative commissions as an affiliate, go promote Mangools. Who is this Mangools affiliate program best suitable for? Best suited for medium to advanced affiliate marketers. This affiliate program works best for IM and SEO related niches. Here’s what you need to know about Mangools before promoting its affiliate program. How to sign up for Mangools affiliate program to promote it? Click here to sign up for Mangools as an affiliate for free and start promoting their rocking SEO tools to earn 30% recurring commission for lifetime. Do you want to promote an incredible membership site that teaches people how to make more money as an affiliate or become a profitable affiliate marketer? If yes, Affilorama is a great affiliate program for you which also pays generous 50% commission on every membership sale you generate. Who is this Affilorama affiliate program best suitable for? You can earn huge if you’re a medium to advanced affiliate marketer. This program works best where your target audience are looking for best paid membership sites to learn about affiliate marketing and selling in general. How will you get paid? Through PayPal, paid every single month. How to sign up for this affiliate program to promote it? Click here to join Affilorama as an affiliate to start earning 50% commission on each membership. SEO PowerSuite (also known as Link Assistant) is a powerful pack of SEO tools which give you access to rank monitoring, link analysis, site audits, keyword research and so on. Who is this SEO PowerSuite affiliate program best suitable for? Best suited for those affiliate marketers who are in SEO and IM niches where their target audience are mainly looking for an all-in-one SEO toolset at affordable prices. 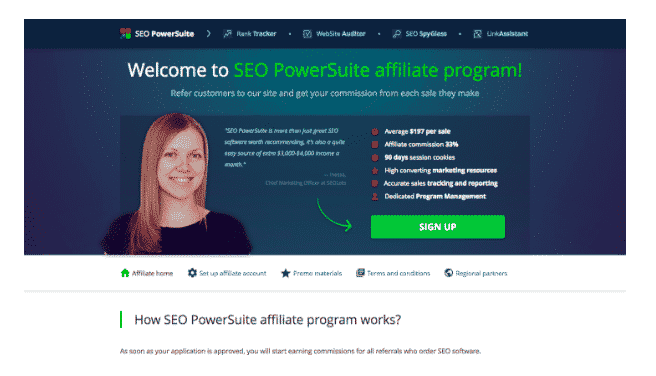 Click here to join SEO PowerSuite affiliate program and start earning regular 33% commission for all order your referrals make each month. If you’re looking to promote an SEO affiliate program which gives you recurring commissions for lifetime, SpyFu is a great choice which offers excellent payouts at 40% commission per sale. That means, by using your affiliate referral link, if anyone buys the $299 Team plan from SpyFu, you’ll earn $119.60 total, paid out every month. Who is this SpyFu affiliate program best suitable for? Best suited for those affiliate marketers who are into IM niche where most people are looking for competitor analysis tools. Here’s what you need to know before promoting its affiliate program. How to sign up for this SpyFu affiliate program to promote it? 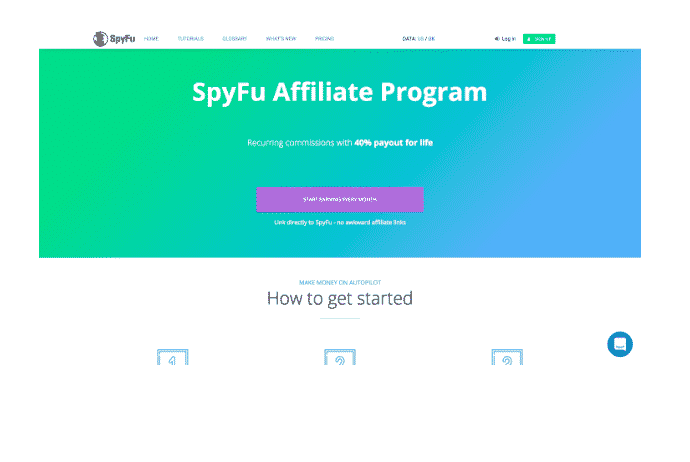 Click on this link to join SpyFu affiliate program to earn 40% recurring commissions for lifetime by promoting SpyFu SEO affiliate program. No matter what industry you are in, you can always find a reliable hosting service to promote as an affiliate marketer to make more commission each month. Here are 5 of the high paying web hosting affiliate programs you can promote to make HUGE commissions (some of them even give you recurring commissions). Kinsta offers managed WordPress hosting which offers really huge payouts where you can earn up to $500 for every referral besides 10% monthly recurring lifetime commissions. Who is this Kinsta affiliate program best suitable for? No matter what industry you are in, you can promote web hosting affiliate programs like Kinsta. This is best suited for medium to advanced affiliate marketers who know how to sell “high paying” programs. Here’s what you need to know before promoting affiliate program. What’s the average commission rate does it provide? Depending on the plan, you can earn from $50 to $500 for every referral along with 10% monthly recurring lifetime commissions. How to sign up for this Kinsta affiliate program to promote it? Sign up for Kinsta affiliate program and start earning 10% monthly recurring lifetime commissions. WPEngine is one of the BIGGEST paying affiliate programs in the web hosting industry which offers you $200 per every single sale you make! Who is this WPEngine affiliate program best suitable for? If you’re looking for high referral affiliate programs to promote, WPEngine can be a great fit for you as you can refer other affiliates and earn $50 for every sale they refer. Apart from that, you can also get incentive bonus commissions which start at 5 sales per month. Here’s what you need to know before promoting WP Engine affiliate program. What’s the average commission rate does it provide? You can earn $200 or 100% of the first month’s payment (whichever is higher). How to sign up for this WPEngine affiliate program to promote it? Click here to become an affiliate for WP Engine and start earning $200 per sale. Do you want to earn more passive income by promoting a web hosting solution that offers you recurring commissions every single month from your referrals? Rose Hosting VPS affiliate program is for you then. Who is this Rose Hosting affiliate program best suitable for? From beginners to advanced affiliate marketers who want to promote recurring web hosting programs, this is a great fit. And if you’re looking to promote a web hosting service that offers you recurring commissions every time your referral pays money, Rose Hosting is a great program to promote no matter what industry you are in. Here’s what you need to know before promoting Rose Hosting affiliate program. What’s the average commission rate does it provide? You get 50% commission on the first month’s payment (up to $30 for initial sale) along with 10% monthly recurring commission on every subsequent payment from your referrals. How to sign up for this Rose Hosting affiliate program to promote it? Click here to sign up for Rose Hosting affiliate program and start earning 10% monthly commission on every subsequent payment from your referrals. Bluehost is one of our favorite hosting affiliate programs that convert really great especially if you’re trying to promote an affordable hosting service that offers excellent hosting features. Who is this Bluehost affiliate program best suitable for? Anyone who are looking to promote affordable hosting solutions can promote Bluehost affiliate program to earn decent commissions per each sale. How to sign up for this Bluehost affiliate program to promote it? Click here to join Bluehost affiliate program and earn decent commissions per each sale. Both Bluehost and HostGator belong to the same EIG group which offers reliable hosting plans (including monthly hosting plans) which pays you hefty commissions per sale. Who is this HostGator affiliate program best suitable for? If you’re looking to promote a web hosting service that also offers monthly hosting plans, HostGator can be your best bet. The best thing about HostGator affiliate program is that, if you make 21+ sales in a month, you get paid $125 for each one of them (when compared to $50 for sales for making just 5 sales in a month). So you can get paid huge commissions by making 21+ sales as opposed to 5 or less monthly sales. 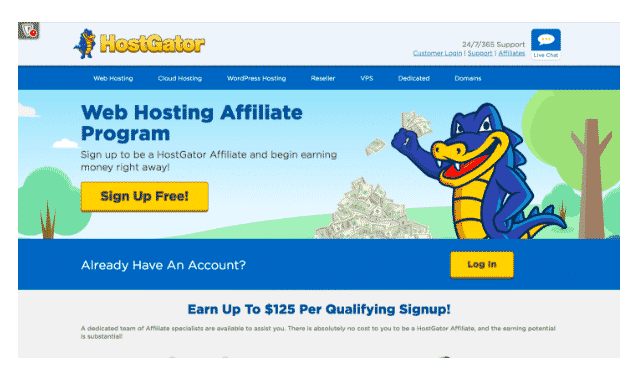 How to sign up for this HostGator affiliate program to promote it? Click here to sign up for HostGator affiliate program and start making more commission. SiteGround offers affordable pricing options by giving customers SSD storage (that means ultra fast servers), so if you want to promote a high paying affiliate program that actually offers faster website speeds, SiteGround is a better choice. Who is this SiteGround affiliate program best suitable for? Even if you’re getting started as an affiliate, you can easily promote SiteGround hosting plans to start earning commissions from the first month itself. The great thing about promoting SiteGround as an affiliate is that, even if you make 1 sale, you still get paid (there’s no minimum threshold limit as well). Just like HostGator, SiteGround also offers you the same kind of high paying affiliate commissions where you get paid more by referring more customers each month. How to sign up for this SiteGround affiliate program to promote it? Click here to sign up for SiteGround affiliate program and start generating more sales. Do you want to promote high paying email marketing affiliate programs? Here’s a list of 4 of the best paying affiliate programs for email marketing (some of them also offer you recurring commission where you can earn commissions for lifetime, not just once!). GetResponse needs no introduction to most affiliate marketers as it is one of the best paying email marketing affiliate programs that pays high recurring commissions per every successful referral you generate through your affiliate links. GetResponse offers you 33% generous recurring commission on each plan so you’ll get a chance to earn 33% recurring commission every single month (as long as your referral keeps using GetResponse). Who is this GetResponse affiliate program best suitable for? From beginners to advanced affiliate marketers, anyone can get the most out of this affiliate program. Here’s what you need to know before promoting GetResponse affiliate program. How to sign up for this GetResponse affiliate program to promote it? Click here to join GetResponse affiliate program and start earning more passive income each month. AWeber is probably the biggest email marketing solution which is used by millions of people worldwide and it is around the email marketing business for over 2 decades now (they started way back in 1998). AWeber offers 30% recurring commissions to all the affiliate promoters who get monthly payouts depending upon the plan their referrals choose. If your referrals moves up to higher email marketing plans, your recurring commissions also increases. Who is this AWeber affiliate program best suitable for? From beginners to advanced marketers, AWeber converts the best. Here’s what you need to know before promoting AWeber affiliate program. How to sign up for this AWeber affiliate program to promote it? Sign up for AWeber affiliate program and earn 30% recurring commissions each month. ConvertKit is an email marketing solution which is created for bloggers to easily manage all of their email marketing solutions. It is one of the few email marketing providers that provide hefty recurring commissions to all its affiliates. If your target audience are mainly digital marketers or bloggers, you can easily convince them to give a try to ConvertKit as it has some of the exclusive email marketing features like email automations, drag-and-drop sequence builder, integrations with e-commerce, landing page, membership site providers and so on. Who is this ConvertKit affiliate program best suitable for? From medium to advanced affiliate marketers, this affiliate program works best. Perfect for those who’re in the IM niche. How to sign up for this ConvertKit affiliate program to promote it? Click here to join ConvertKit affiliate program to start earning 30% commission each month from everyone you refer. Are your website audience are entrepreneurs or digital marketers who are looking to increase their leads and email signups? Then, try promoting Leadpages as it is one of the best affiliate networks you can promote to them. Leadpages offers generous recurring payouts so you can make a ton of commissions even if you can sell few sales each month because Leadpages is a high end affiliate program which gives you 30% recurring earnings. For example, if someone uses your referral link to buy a Pro Annual membership through (Pro Annual membership is $577 a year), you make $173.10 commission. Not only that, you also receive a $173.10 commission every year when your referral renews their membership. Who is this Leadpages affiliate program best suitable for? This affiliate program works best for medium to advanced affiliate marketers whose target audience are mostly looking to build profitable online websites, courses, membership sites etc where they need “highly qualified leads” and email subscribers as Leadpages offers a ton of features such as lead boxes, pop ups etc to easily convert visitors into leads into sales. Here’s what you need to know before promoting Leadpages affiliate program. How to sign up for this Leadpages affiliate program to promote it? Join Leadpages affiliate program now and start earning high recurring commissions every month. ActiveCampaign is the industry leading email marketing technology that is exclusively made for marketing automation and small business CRM. 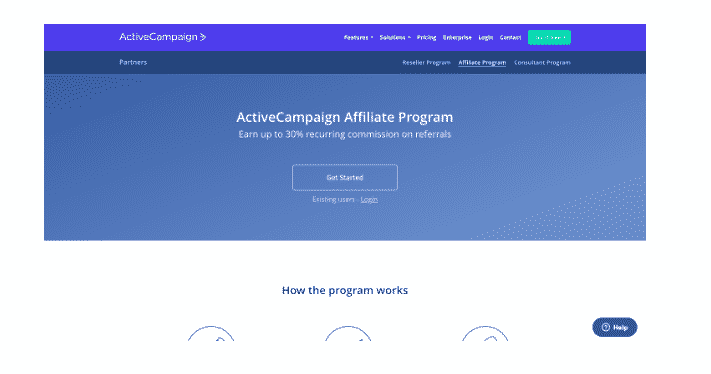 So if you want to promote a leading email marketing solution where you can earn up to 30% commissions every single month (where you’ll be paid monthly for all accounts you’ve referred), ActiveCampaign should be your in list of best affiliate products to promote to your audience. Who is this ActiveCampaign affiliate program best suitable for? If you’re targeting small business owners who deals with customer relationship management which also deals with email marketing solutions like broadcasts, email newsletters etc, Active Campaign can be a great affiliate program to promote. Here’s what you need to know before promoting ActiveCampaign affiliate program. How to sign up for this ActiveCampaign affiliate program to promote it? Become a part of ActiveCampaign affiliate program and start earning generous 30% recurring commissions each month for every successful referral you send. Here’s a list of 5 of the high paying WordPress related affiliate programs your can promote to people who are using WordPress. This list includes WordPress themes, plugins etc and help you earn maximum commission per every successful sale you make. If your target audience are WordPress users, you can easily promote premium WordPress themes such as My Theme Shop (which one can buy at cheaper rates) to earn huge commissions per sale. Who is this My Theme Shop affiliate program best suitable for? From beginners to advanced affiliate marketers, everyone can use My Theme Shop affiliate program to promote affordable yet premium looking WordPress themes. Here’s what you need to know before promoting My Theme Shop affiliate program. How to sign up for this My Theme Shop affiliate program to promote it? Join My Theme Shop affiliate program and start making 55% commission per each sale. If you want to promote promote premium responsive WordPress themes to your website audience to make more affiliate sales, you should definitely consider promoting Template Express themes. Who is this Template Express affiliate program best suitable for? From beginners to advanced affiliate marketers who are looking for promoting low cost yet premium looking responsive WordPress themes. Here’s what you need to know before promoting Template Express affiliate program. How to sign up for this Template Express affiliate program to promote it? Sign up for Template Express affiliate program and start earning a whopping 70% commission per each sale. OptinMonster is one of the widely used lead generation software for marketers and all kinds of people who want to turn their website visitors into leads and sales. So if you’re looking to promote a lead generation software (which was founded by Syed Balkhi, the guy behind WPBeginner), OptinMonster is for you which also offers generous affiliate commissions on every sale. Who is this OptinMonster affiliate program best suitable for? From beginners to advanced affiliate marketers, anyone can recommend this product to their audience. Here’s what you need to know before promoting OptinMonster affiliate program. How to sign up for this OptinMonster affiliate program to promote it? Sign up by joining OptinMonster as an affiliate to earn 20% commission on every sale you generate. Elegant themes is one of the widely promoted affiliate programs which is promoted by more than 30,000 affiliates all around the world and it pays out over $3,000,000 per year. It is also one of the most popular premium WordPress themes which is used by over 500,000 people. Who is this Elegant Themes affiliate program best suitable for? For beginners to advanced affiliate marketers who are looking to promote a bundle of delicious looking premium WordPress themes at affordable price tag. Here’s what you need to know before promoting Elegant Themes affiliate program. How to sign up for this Elegant Themes affiliate program to promote it? Join now as an Elegant themes affiliate to start promoting 87 gorgeous WordPress themes at one price. If you’re looking for an affiliate program that pays you for generating successful sales on WordPress themes and plugins, have a look at InkThemes. Who is this InkThemes affiliate program best suitable for? 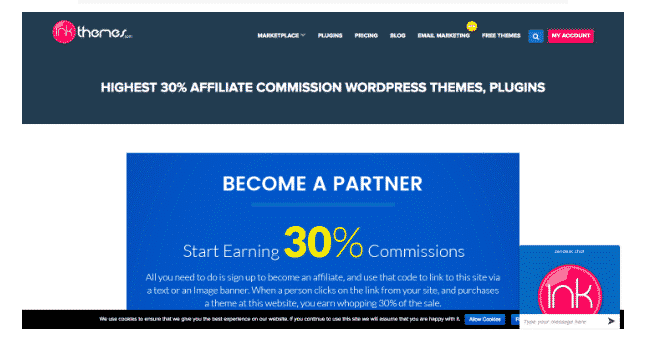 Anyone who’s looking to promote highest paying WordPress theme affiliate programs can join this affiliate program to earn 30% commission per sale. Here’s what you need to know before promoting InkThemes affiliate program. How to sign up for this InkThemes affiliate program to promote it? Sign up for InkThemes affiliate program to promote excellent premium WordPress themes that pay you high paying profits. This is one of the most important questions to ask yourself before you zero it down on promoting the right products to make more as an affiliate. The affiliate products you choose to promote literally determine the success of your affiliate marketing journey. When considering what affiliate programs to sign up for, here are a few important factors you should consider. The first question to ask yourself before you start finding any high paying affiliate programs is this: “who is my target audience and how can I offer help with the products I promote?”. Once you know your target audience, you can easily find out their wants and needs so you can make a list of all the product ideas that you can use to promote to a group of people who are actually interested in your products. There’s no point of promoting high paying affiliate programs to irrelevant group of people, right? Because no one buys just because you’re promoting a product hard. Here are few more questions that can help you easily define your website target audience so you can promote affiliate products more effectively. What are your marketing demographics such as age, location, gender, income etc? What specific things do your buyers have in common? What makes your target audience to buy something online? Discounts, offers, huge deals? How can you best reach your target audience to promote your products effectively? Where is your target audience mostly hang out online? By answering the above questions, you get a clear idea about how to promote the right products to monetize your site. If you look at the list of high paying affiliate programs mentioned on this post, you’ll most find the products that offer recurring commissions every month (or year). Choosing those products to promote which give you recurring profits is one of the easiest ways to make more passive income as an affiliate marketer. Observe any successful affiliate marketer who is making thousands of dollars from affiliate marketing every month, you’ll notice that they heavily rely on recurring commission generating programs or networks. Do you know why? The simple reason is: you not only get paid once you make the sale but you also get paid each time your referral continue using the service or product that you recommend. That being said, here are few ways to find high paying recurring affiliate programs that help you earn huge profits every single month. Simply do a Google search using search strings like “recurring commission + marketing” (replace “marketing” with your niche such as fitness, real estate, SEO or anything else). You’ll come up with a ton of sites where you can find a lot of affiliate products you can use to earn recurring profits. Try to pick email marketing related affiliate programs as most of them offer recurring commissions that pay you commissions every single month. One of the most powerful ways to increase your affiliate commissions is to spy on your competitors websites to find out what kind of affiliate programs and networks they are using to earn huge commissions each month. There are few affiliate marketers like Pat Flynn who shares everything including all the affiliate products he promotes along with the commissions he makes through his income report section on his blog. By carefully analysing those sites, you get a better idea about the best paying affiliate products you can promote to become a successful affiliate. Just make sure to keep your target audience in mind (the #1 point to remember) while choosing affiliate products. Make sure to get access to tools like SEMrush which helps you easily find out all the top performing pages of your competitors websites (so that you can easily analyse what products they are promoting to make more sales each month). Each and every affiliate program mentioned here is worth giving a try. They are not only best affiliate programs for bloggers but they also have great collection of products that your audience love. No matter what industry you are in, you can use the above list to find a few of the best affiliate programs to start generating more passive income. So what are your thoughts on the high paying affiliate programs listed above? Did you like the list and do you have any questions? Share your thoughts in the comments below. Wow very nice information you shared over here. I like here most affilorma and bluehost because of they give high percentage of commission. For affiliate marketer these information can be useful. Excellent work. Highly valuable information for someone who wants to get into affiliate marketing programs.Provides a clear understanding to the beginner.Great work done! This is a long article about high paying affiliate programs. Thanks for sharing this article. You had done more work and efforts to publish this article. Awesome! These programs pay a pretty penny Anil. I dig being an Amazon Associate because even though payouts are low compared to other programs, per affiliate cut, Amazon does a stellar job spreading the word for you and making it easy for folks to buy. Win-win on so many levels. Winning programs here.